General Motors recalls 18,500 HD trucks at risk of fires from fuel leaks. March 20, 2019 — General Motors is recalling more than 18,500 model year 2016-2018 GMC Sierra 3500 and 2016-2018 Chevrolet Silverado 3500 trucks equipped with gas engines and dual fuel tanks. The automaker says the rear fuel tank may overfill the front tank if the fuel level sensor in the front tank gets stuck in the low-level position. The overpressurized gas tank can expand and hit the driveshaft and result in a hole in the front fuel tank. From there fires may occur if leaking fuel drops onto an ignition source. GM had recalled 2011-2015 Chevrolet Silverado 3500 and GMC Sierra 3500 trucks in 2017 for the same problem and said at the time there was no evidence to suggest the problem existed in trucks built after 2015. However, the automaker monitored field reports for later model years and eventually opened an investigation into 2016-2018 heavy-duty trucks. Investigators found the problem could occur in trucks built before General Motors began using new low-pressure fuel pumps in October 2017, but there was no evidence overpressurized tanks were present in trucks built with new fuel pumps. 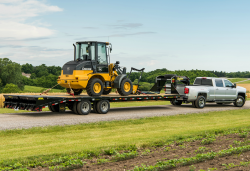 As in the 2017 recall, the condition is limited to HD trucks with gas engines and the dual tanks, and the only trucks built with these options are the 3500 series chassis cab trucks without beds. Chevy and GMC dealers will replace the rear gas tank fuel pump modules and also inspect the front fuel tanks and replace them if needed. According to General Motors, the replacement fuel pump modules have lower pressure limits than the pumps currently in the trucks. Drivers may have warning in the form of knocking or grinding noise from a driveshaft making contact with an overpressurized and expanded front fuel tank. GM doesn't know when the Silverado 3500 and Sierra 3500 recall will begin, but Chevrolet Silverado 3500 owners may call 800-222-1020 and GMC Sierra 3500 owners with questions should call 800-462-8782.